Does it work? These seed oils contain predominately healthful, polyunsaturated fats such as ALA (as from flax) and/or GLA (as from evening primrose) (See "What It Is"). Substituting these for saturated fats in your diet can lower your risk of cardiovascular disease. Taken as a supplement, they may help with the following conditions, although the evidence remains only preliminary: acne, ADHD, dry eye, bipolar disorder, diabetic neuropathy, mastitis, eczema, rheumatoid arthritis, and Raynaud's phenomenon. (See "What It Does"). Best choice? ConsumerLab.com's tests found that most products were high-quality, although three failed to pass tests for freshness. See CL's Top Picks among products that were Approved. Cautions Although generally safe, these oils can cause mild nausea and diarrhea, but there are ways to lessen this. Rarely, allergic reactions to flaxseed have been reported. Use these oils with caution if you are pregnant, have a seizure disorder, hemophilia, take blood-thinning medication, or are considering use in an infant. (See "Concerns and Cautions"). ALA (alpha-linolenic acid) is an omega-3 essential fatty acid. An essential fatty acid is one that the body needs but must be supplied by the diet, since the body cannot manufacture it or cannot manufacture enough of it. From ALA, the body has a limited ability to manufacture two other important omega-3's — EPA (eicosapentaenoic acid) and DHA (docosahexaenoic acid) -- it can convert small amounts of ALA into EPA and is even less efficient in making DHA. It is estimated that between 5 to 10% of dietary ALA may be converted into EPA, and about 2 to 5% may be converted into DHA (Davis, Am J Clin Nutr 2003), although conversion may be somewhat higher in young women as well as vegans and non-fish eating vegetarians (Burdge, Br J Nutr 2002; Welch, Am J Clin Nutr 2010). Among plant seeds, flaxseed (also known as flax seed (Linum usitatissimum) or linseed) contains among the highest concentration of ALA — in fact, 55% of the oil in flaxseed is ALA. Chia seed also has a very high concentration (58%) of ALA in its oil, although the seed itself has less total oil than flaxseed. Phytoplankton and algae are also rich sources of ALA. The oil from hemp and black currant seeds also contain, respectively, 19% and 13% ALA. Soybean oil, canola oil, and walnuts also contain some ALA.
GLA (gamma-linolenic acid) is an omega-6 fatty acid. The body ordinarily is able to produce sufficient GLA from another omega-6 fatty acid, linoleic acid (LA), which is an essential fatty acid found in foods containing oils from corn, sunflower, safflower, soy, peanut and other plants, including flaxseed. However, GLA production might be reduced in several conditions (advanced age, diabetes, high alcohol intake, eczema, excessive saturated fat intake, elevated cholesterol, and some vitamin/mineral deficiencies.) In such cases, it is possible that supplementation may be beneficial. Seed oils from black currant (Ribes nigrum), borage (Borago officinalis), and evening primrose (Oenothera biennis) are among the few that are rich in GLA. Hemp seed oil also contains a small amount. All of these oils are also rich in linoleic acid. Both ALA and GLA, as well as LA, are polyunsaturated fats ("good" fats, as opposed to saturated fats that may increase the risk of heart disease). 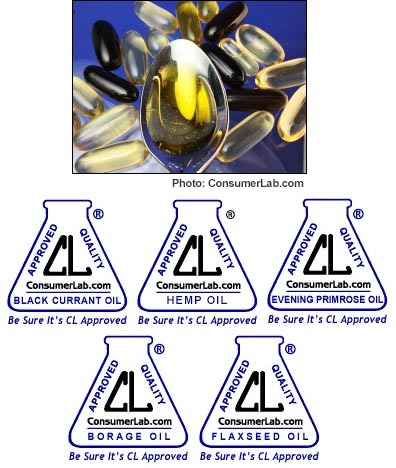 Black Currant Oil, Borage Oil, Evening Primrose Oil, Flaxseed Oil, and Hemp Oil Supplements Review: Sources of ALA and GLA (Omega-3 and -6 Fatty Acids) !